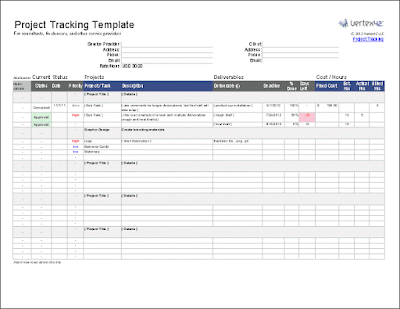 This project tracker is great for contractors, consultants, freelancers and other service providers who are managing or working on multiple projects with multiple deliverables and tasks. It can help improve communication and help you stay in sync with your clients. Just remember that it is not meant to be a substitute for a well-written contract - it's primary purpose is to aid in communication. We developed this project tracking template over time through our own use as we've worked with various sub-contractors over the years on a number of different projects. It is especially useful when you need to track tasks with more than just email, but don't need or want to use more complicated or formal project management software.